LAKE BUENA VISTA, Fla. — Late night. Chatter echoing. Beers cold and bourbon neat. Psst, wanna know what the industry really thinks of the mighty New York Yankees flexing their considerable financial muscle to trade for Giancarlo Stanton? "Yeah, they're going to be...hated," one American League executive says in a dark hallway off the packed lobby above the clinking of the ice cubes at the Walt Disney World Swan and Dolphin Resort. "The game's better when they're hated." FROM RAGE TO RHAPSODY, amazement to amusement, the Yankees' acquisition of Stanton and their inheritance of the remaining 10 years and $265 million on his deal have sent Major League Baseball into orbit. Hammered into Boston was the realization that defending its AL East title just got tougher. Pounded into the American League was the reality that the Yankees' supposed rebuild was completed at warp speed. Drilled into everybody was the reminder that there are few constants in this game, but always, always at the top of this list is that few can play on the same economic field as the Damn Yankees. Within the industry, there mostly was grudging respect. Within the game's Haves, it's business as usual. It's the way they live. Within the Have-Nots, there was resignation combined with the small comfort of knowing that when a backwoods franchise like Miami gets itself into a financial bind, there is a club like New York that offers a soft landing. The Marlins, by the way, are only on the hook for $30 million of the $295 million left on Stanton's deal. If you're looking for pure, high-octane hatred, well, mostly, that'll have to be left to the fans of 29 other teams. The baseball people have enough to worry about trying to get their own teams in order to dwell on the deal. "It's not the first time that teams with that economic power have done this," Baltimore Orioles manager Buck Showalter says, noting that AL East rival Boston acquired ace Chris Sale at last year's winter meetings after signing ace David Price as a free agent the year before. "The Yankees have done it and are probably going to do it again. God bless 'em. They should." LUNCHTIME. EXECUTIVES SCATTERING FROM their high-floor suites. Midday sun shining through the resort windows, obscured only by the long, tall shadow of Stanton. Will he hit 60 home runs next summer? Will he and Aaron Judge lead the Yankees to their 28th World Series title in a blast of shock and awe? Might they force the cancelation of a game simply because they will knock the Yankees' entire supply of baseballs out of the park during batting practice? What in the world can we anticipate? What should we anticipate? "I think it's great for the game," says David Ross, the retired longtime catcher now serving as a special assistant to baseball operations for the Chicago Cubs. He is working (and attending) his first winter meetings, and already he's gotten an eyeful. "It reminds me a lot of the NBA where you get a lot of power teams," he continues. "It's going to make everybody else step up their game. I don't look at it as the Evil Empire. When you see the Yankees getting back to what you expect them to be, it just seems normal." Normal, of course, is open to interpretation. "It's the Evil Empire, right?" Toronto Blue Jays manager John Gibbons says, eyes twinkling, smile cracking. "It is good for baseball. I'm not a fan of the balanced schedule, especially with two wild cards. We play each other too much. But in our division, a lot of people like the way it is because people see those teams more, and they bring their big-star players. "So from a financial end, they love it." Los Angeles Angels general manager Billy Eppler helped orchestrate his own blockbuster this winter, signing Japanese two-way superstar Shohei Ohtani. Before taking control of the Angels for the 2016 season, Eppler worked in New York under Yankees GM Brian Cashman from 2004-2015, the last four seasons as an assistant GM. The Angels' moment in the spotlight with Ohtani lasted about two blinks of an eye before the St. Louis Cardinals and San Francisco Giants both announced Stanton would not waive his no-trade clause for them, allowing the Yankees to swoop in for the kill. "It's a team just trying to be great," says Eppler, who regularly communicates with his old boss. "That's it. ... Just like all of us are trying to do." AS MUCH CHATTER AS the Stanton deal has generated, it's hard to imagine anyone was truly surprised. This is what the Yankees always do. Survey the landscape. Scour the bushes. 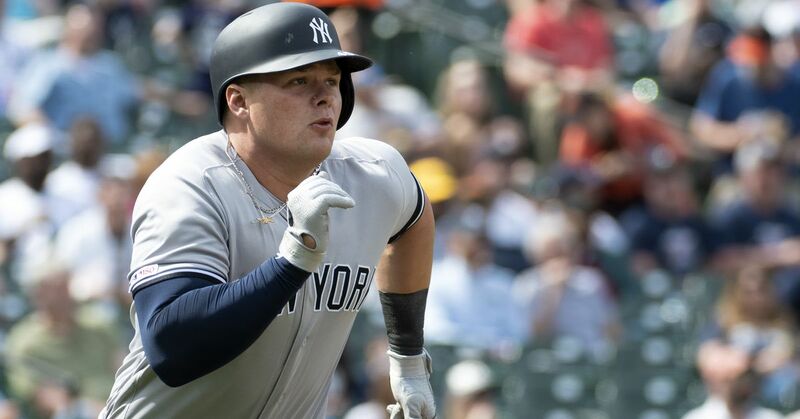 Do what it takes, from making creative three-way deals (how they acquired Didi Gregorius, Derek Jeter's replacement at shortstop, in a trade with Detroit and Arizona following the 2014 season) to ransacking badly run franchises begging to be looted. "We've seen one of our MLB jewelry stores become a pawn shop," agent Scott Boras says, slamming the Marlins and their new ownership group, battering Jeter in particular, who skipped the winter meetings yet was widely visible attending a Miami Dolphins game during the week. Talk about bad optics. Meanwhile, the Yankees' acquisition of Stanton has interrupted all the talk that dominated last year's winter meetings, that Bryce Harper, the star of next winter's free-agent market, will command a deal of at least $400 million and that the Yankees will be the ones to scoop him up. But even Harper's agent finds it difficult to fault the Yankees for cranking up their economic engine, what with all of that smooth humming and whirring. "I'm never going to fault a good jeweler," Boras says. "When there's diamonds to be had, they're in the diamond business and know they can go out and get a great deal. ... You tip your cap to how Cash and all of them [work]. That's going to make an exciting process. ... I think they're in position to have a wonderful Bronx opera." And as the week closed, the Yankees were among the small handful of teams engaged with the Orioles to gauge the cost of Manny Machado. "Cash and his group in the baseball ops department are always looking for opportunity," Eppler says. "They're not afraid to make bold moves. They're not afraid to make unpopular moves. One thing I've always marveled at with Brian is his focus on what's going to help this organization, not what's going to help me or so on and so forth. He is so focused on doing what's right for the organization. "That's been his lighthouse and his beacon for 20 years, even before he was GM. That consistency has put them on this path of [being] a formidable organization with a [formidable] lineup. That's the common denominator in this thing." THE 1970s. JIMMY NEDERLANDER, then a limited partner of Yankees owner George Steinbrenner, tells the Boss that New York is a town of stars. Nederlander knew, of course. He founded the family company that went on to become the largest owner of theater property in the country. And as such, of course, he was a giant on Broadway. "I know the city we're in, and I know that our fans love the big marquee players," Hal Steinbrenner, who inherited the Yankees from his Boss dad, says during a press conference to introduce Stanton on Monday. "This is New York City. These are the Yankees." This has been the internal battle waged in the offices of Yankee Stadium for the past few years, insiders tell B/R: Cashman reached a point at which he recognized the Yankees' need to get younger and more athletic. Insiders describe times of tension within the front office relating to Cashman's desire to rid the club of old, dead weight like Alex Rodriguez and Mark Teixeira and restock the organization with bright young talent. Steinbrenner was skeptical of a Yankees team without stars. That Cashman was given latitude to do it his way became evident during the summer of 2016, when the club shed Rodriguez, Teixeira and others. 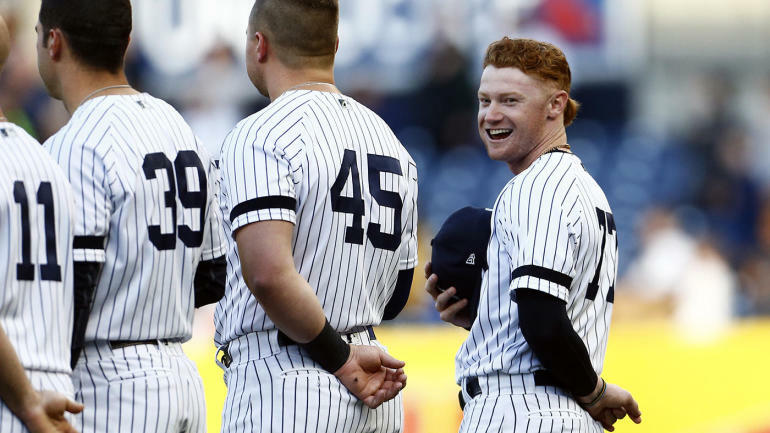 Trading relief ace Andrew Miller to Cleveland for a package of young prospects, including pitcher Justus Sheffield and outfielder Clint Frazier, was a highlight of what turned out to be a lightning-fast rebuild. The Baby Bombers, as the group led by Judge, Sanchez and Greg Bird came to be called, pushed the Yankees all the way to Game 7 of this year's American League Championship Series. But as they did, in a billion-dollar incarnation of the latest Yankee Stadium, there is no escaping one harsh reality: Attendance in the Bronx during the past two years—a per-game average of 37,820 in 2016 and then 38,851 last summer—was the lowest in back-to-back seasons since 1997-98. Since 1999, the year the Yankees won the second of three consecutive World Series titles, they've drawn three million or more fans annually over 19 consecutive seasons (they were over four million from 2005-2008). The streak, though, barely survived over the past two seasons, when the Yankees drew 3,063,405 in 2016 and 3,146,966 this year. "I think Stanton was too big of an opportunity for them to walk away from," an owner of a rival club tells B/R. "He's a hell of a guy, the MVP of the NL, and they're not drawing the way they hoped to. They're not making any money. They've got so much debt tied to the stuff they've done." Now, Stanton (6'6", 245 pounds) and Judge (6'7", 282) come as if designed by engineers to fuel a team that will pack that stadium and, if things turn out as planned, whip the Bronx denizens back into a frenzy not seen since they left the old ballpark next door. MONDAY AFTERNOON. THE PODIUM in the front of the press room is still warm from a couple of hours earlier, when new Hall of Famers Alan Trammell and Jack Morris spoke of the agony and the ecstasy of grinding through a two-decade wait to land in Cooperstown. Now Stanton, Cashman and new manager Aaron Boone hover before a standing room-only crowd of industry types—media, executives—and a live broadcast on MLB Network. It's the first sighting of Stanton in a Yankees cap. And it is the last time all week the podium will be used. Amid a winter meetings of much talk and little action, the Yankees swallowed up most of the oxygen. Stanton says he thought this day always would come, even when he signed the 13-year, $325 million deal ludicrously offered by now-former Marlins owner Jeffrey Loria, who had all the enthusiasm of a baseball expert and none of the knowledge during his tenure running, to use Boras' term, Miami's pawn shop. "I overthink and think again on all possibilities that can happen," Stanton says. "So with the history of everything, yeah, of course it was in my mind, and I knew I had to be prepared." He declined offers to play in both St. Louis and San Francisco, he says, because he thinks the Yankees are ready to win now and ready to win for a longer period of time. Whenever he saw them play, they impressed him. Though as his agent, Joel Wolfe, points out, Stanton hasn't seen them play in October, because the slugger wants to win so badly that he annually scheduled European vacations during the postseason because he wanted to get as far away from it as possible if he wasn't participating. "Just watching them from afar, seeing their young, dynamic group, the way they flow together on the field, how they never give up, never quit, the atmosphere, the storied franchise," Stanton says. "There's not much you can say about why you wouldn't want to be there." Boone had barely been named to replace Joe Girardi as manager before he was gifted with a fearsome middle-of-the-lineup hitter. "You wake up, and you're not sure that we were necessarily in on Stanton, but [with] how quick it kind of came together ... sure, that catches you off guard," Boone says. "But you also understand it's the New York Yankees." Says Hal Steinbrenner: "I've always said that New York's a marquee town, and I think it's important to have marquee players. But more important than that ... [is] to have veteran players that could be mentors for the young kids. And we've got a lot of young kids." Legendary New York sports columnist Red Smith once wrote that "rooting for the Yankees is like rooting for U.S. Steel." Little has changed more than half a century later. The Yankees brand is ubiquitous, like Starbucks and CVS. They gobble up the mom and pop shops where they can. Even if you're already a formidable opponent, they keep your attention. New Boston manager Alex Cora, a friend of Boone's, was at home in Puerto Rico when he learned the Yankees employed a run-producer who will make his rookie season as manager even more difficult. "I saw the rumors on Friday night going to bed," Cora says. "I got up in the morning and saw it." He attended a charity event hosted by Yadier Molina on Saturday, and there was a moment when Cora looked up and saw a horde of reporters coming at him. "And the first thing I said is, 'I ain't talking about Stanton,'" says Cora, who played in this rivalry as a Red Sox player from 2005-08 and understands that the day is coming when he will not be able to escape the subject. DINNERTIME. WEDNESDAY. HALLWAYS EMPTYING. The lack of action brings a sort of malaise over these meetings as the week crawls to a wrap, but New York's gold rush keeps the adrenaline stoked. What is it about hating that keeps us coming back for more? "When teams are stacked, they're always hated," another American League executive says. "That's all sports, but being the Yankees doesn't hurt." Several industry types chuckle thinking back to last December's winter meetings in Washington, D.C., where the Red Sox landed Sale from the Chicago White Sox and Cashman likened Boston to a superteam such as the NBA's Golden State Warriors. "Unfortunately, that's what it seems like now, doesn't it?" says a manager from a Have-Not American League team. "Four or five superteams, like basketball." But this is baseball, and as we all know, baseball is not foolproof. The Red Sox stole the show last winter, but they were wiped out in the first round of the playoffs by the Houston Astros. A couple of winters ago, the San Diego Padres became the darlings of the winter meetings, and that didn't go so well, either. And as one owner notes, the Yankees' Stanton deal takes the focus off the Los Angeles Dodgers, who have spent some $500 million more than anybody else over the past five years (including international bonuses). The Dodgers still haven't won a World Series since 1988. "It's all part of it," A.J. Hinch, manager of the world champion Astros, says. "The good news about stuff like that is it's above our pay grade. Obviously, each team has its own challenges, each team has its own things it's going to address and its own resources, and to each their own. In our sport, you don't have to make the most to be the best." "There's going to be a lot of strikeouts in that lineup, but it's going to be fun to watch for their fans," the AL executive says. "Who knows how many home runs Stanton will hit in that ballpark?" Says Showalter: "If you make real good pitches to those guys, you'll get them out. If you make bad pitches, they'll go a little further than everyone else is hitting them." He pauses, then cracks: "I'm glad they haven't changed the rule where the further you hit it, you get a run-and-a-half or a run-and-a-quarter. Can you imagine if they had one of those Skee-Ball things where the further you get it, the more points you get? "Don't give them any ideas in the Competition Committee. In Yankee Stadium, as little as that ballpark is, they don't need any help." No, they don't. But to New York's credit, the Yankees keep helping themselves. It's easy for fans to hate them, but how many also wish their team's owner were as hell-bent on winning as the Steinbrenners have been for as long as they've been in the game? "It makes everybody else step up their game and spend money," Ross says. "It's healthy for the game. It fuels the fans and the rivalries. "You want people to go watch. Go see how far they can hit the ball. It pushes other organizations to get better, and I just think it's great for the game." A couple of years ago in Arizona, Dave Stewart, the former pitcher, worked with Cashman to complete a trade. Stewart was the Diamondbacks GM who sent Gregorius to the Yankees in that three-way deal in December 2014. A year later, Stewart lured ace Zack Greinke to Arizona on a $206.5 million deal. Instead of sparking a playoff run, the Diamondbacks were a bust in 2016, and Stewart was fired by Arizona. He knows the tension and pressure of a life lived on the high wire, and having returned to his previous role as a player agent, Stewart also knows the bottom line from all sides of the great divide. "You can hate all you want to," Stewart says, "but I admired the Yankees from early on, because they were committed to winning."